EMV 5 is the latest version of Escape's medical (DICOM) viewer, anonymizer and converter. A native 64-bit Cocoa application, EMV 5 combines powerful features with intuitiveness, elegance and ease of use. has a beautiful, intuitive, user-centric interface, that works the way you expect. 64-bit application: increased robustness and compatibility with new Macs (Mac OS X El Capitan or later). Query/Retrieve SCU: query DICOM servers to retrieve studies. Send SCU: send DICOM images to DICOM servers. Servers list: define DICOM servers you usually work with. Multi-series display of up to 4 sequences or clips in many predefined arrangements. Multi-frame display (series, clips, sequences) in freely defined grid. 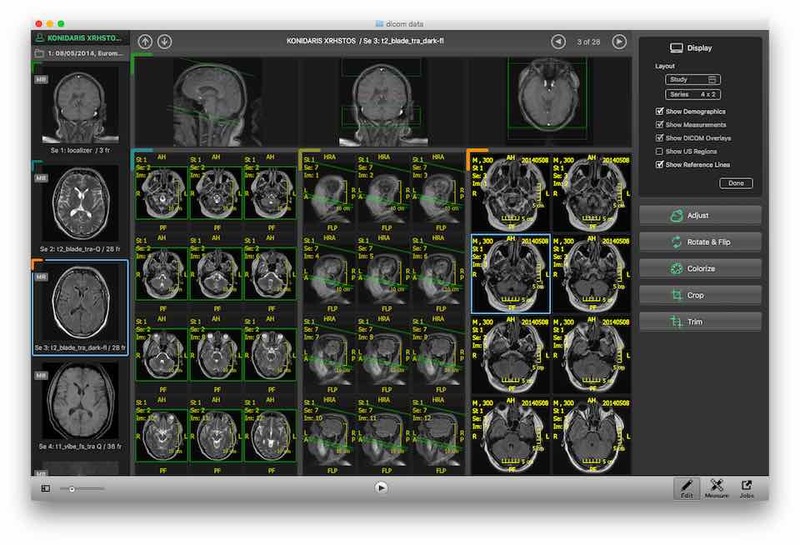 User-controlled display of demographics, DICOM overlays, reference lines. Magnification loupe: appears while pressing [Shift] for instant magnification with user-controlled size and zoom factor. Extraction of localizers if found in the same series as the slices (to allow usage in multi-series display). Reference lines when more images belonging to the same frame of reference are displayed simultaneously (not limited to designated localizers). Alternative colorizations of grayscale and color images. Manual calibration: define the real-world size of pixels manually. User-controlled marking: creates a marked set that allows for selective traversing, anonymizing, exporting, propagation, and more. Cine with autoplay, traverse, user-defined frame rate, and time-vector support. Powerful propagation mechanism: copies all adjustments to sequence, series, study, patient, all patients, marked set. Eraser: turn any rectangle into an eraser to remove burnt-in information (commonly used with US clips). Density measurement in Hounsfield units, where applicable. Calibrated US measurements when calibrated regions are present. Multiple jobs can run independently of one another in the background. Export jobs pane allows for inspection of the status of all export sessions. 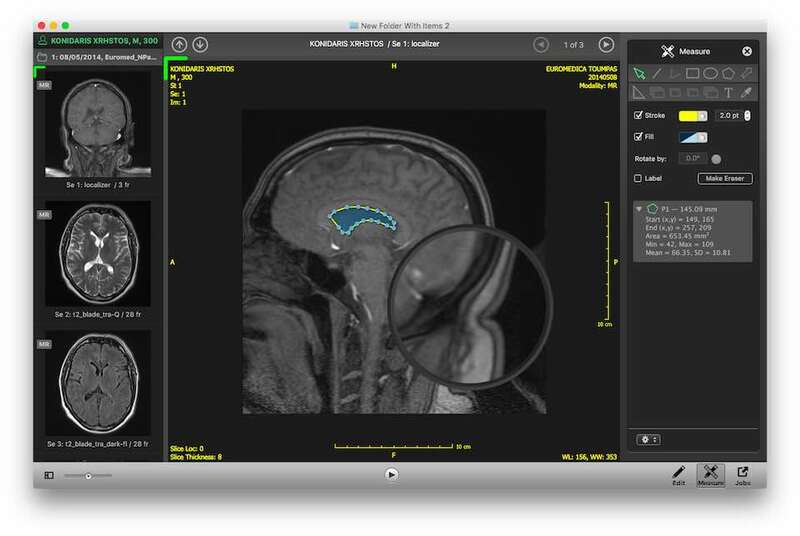 Export to images or movies: frame, sequence, series, study, patient, all patients, marked items. Invoke built-in Profiles or personalize by creating your own for flexibility and speed. 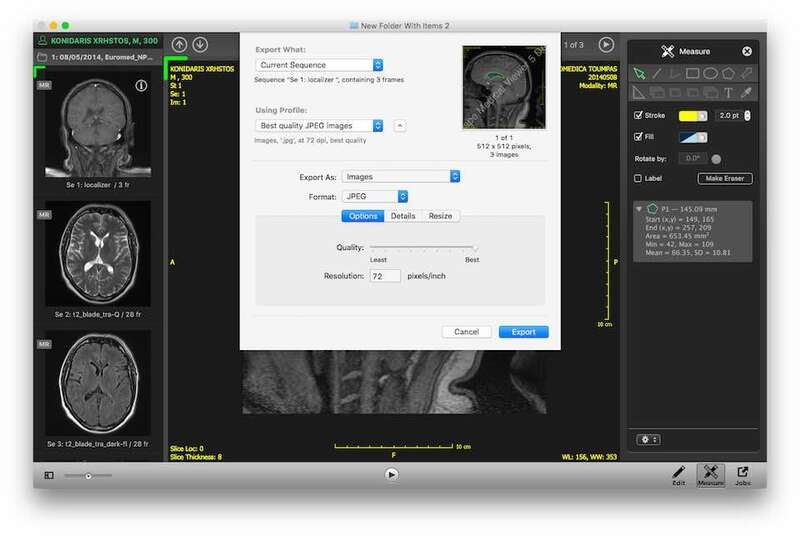 Export to DICOM: mark specific sequences and copy them to a folder, optionally with matching DICOMDIR, ready for burning to a DICOM CD, or other use. Anonymize: file, sequence, series, study, patient, all patients, marked set. 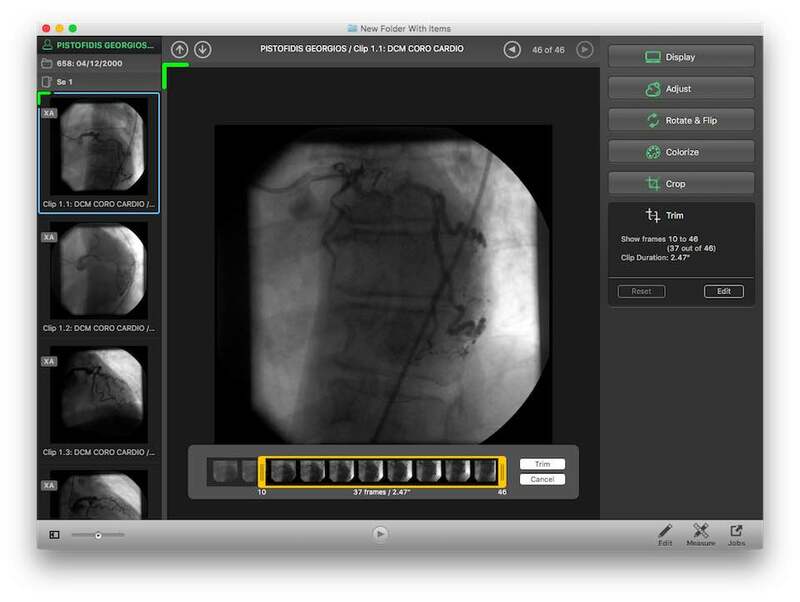 Export DICOM data: file, sequence, series, study, patient, all patients, marked set. Older EMV versions are available on request to owners of the respective licenses. Please contact Sales to obtain the old version for which you have a valid license key.